Disclaimer: Please note that some of the links in this post are affiliate links and I will earn a commission if you purchase through those links. 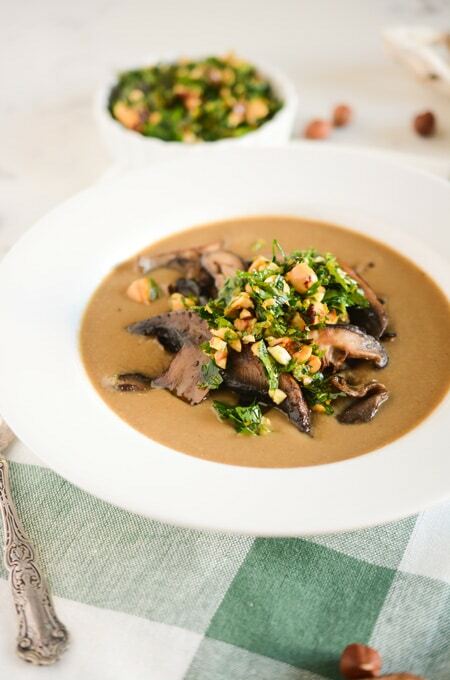 This Mushroom Soup with Hazelnut Gremolata is full of mushroom flavor (and mushrooms)! 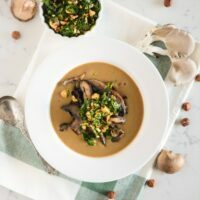 It’s one of my favorite mushroom soups and I love that even though it’s super creamy, it has no cream in it! We cook a blend of mushrooms and veggies and then puree them in a blender to create that creaminess and texture. 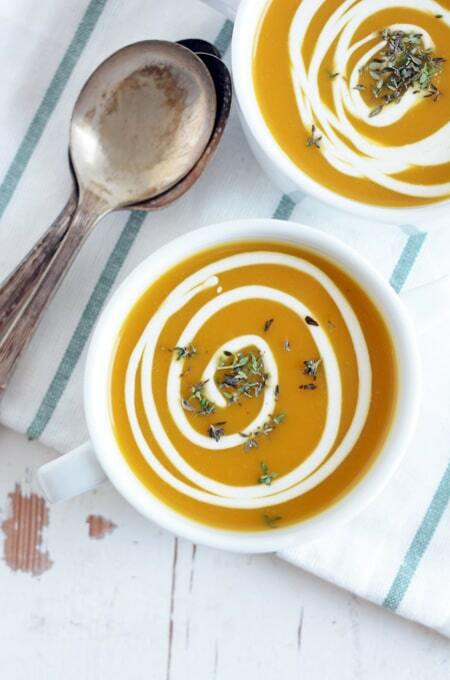 This soup is so mushroom rich, it makes a perfectly filling vegetarian meal. I went to the local farmers market in town and noticed a lady selling beautiful mushrooms there. 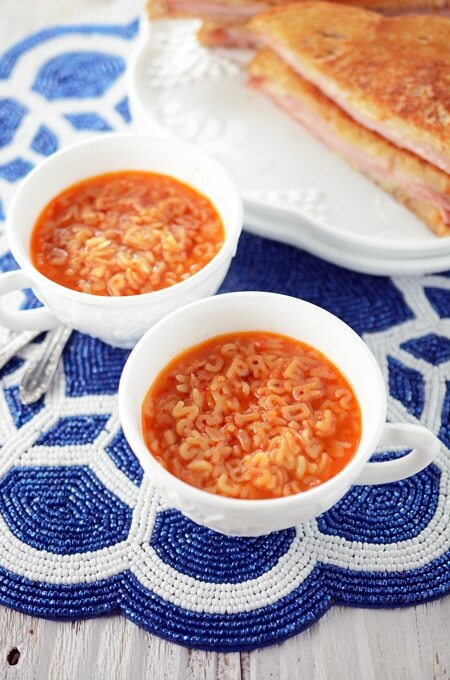 Once I purchased them, I knew they would be a perfect fit for this recipe! A quick little sauté in the pan and they’re ready to be the perfect topping for the soup. The mushroom topping adds flavor and texture. 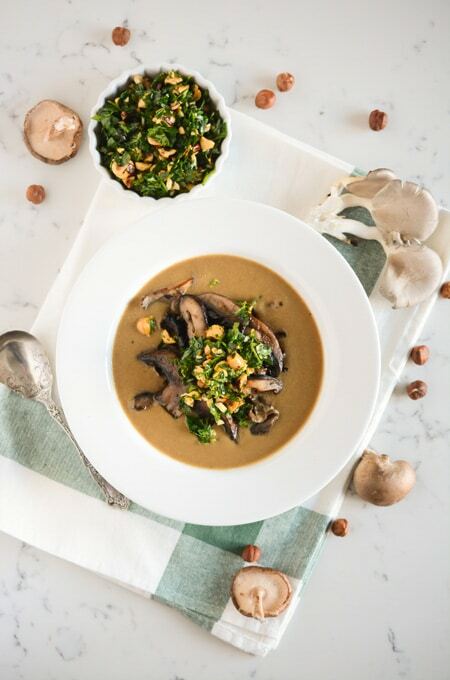 This mushroom soup is also topped with a gremolata. A gremolata is typically made using chopped garlic, parsley and lemon peel. But in this version we add chopped hazelnuts and replace the lemon peel with orange peel. Enjoy! Follow me on Facebook, Instagram, and Pinterest for more recipes! 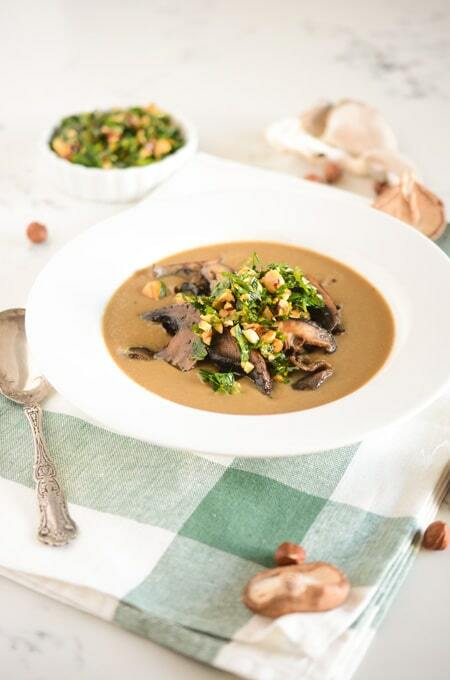 A rich mushroom soup full of mushroom flavor, topped with an exotic mushroom sauté and a hazelnut gremolata. 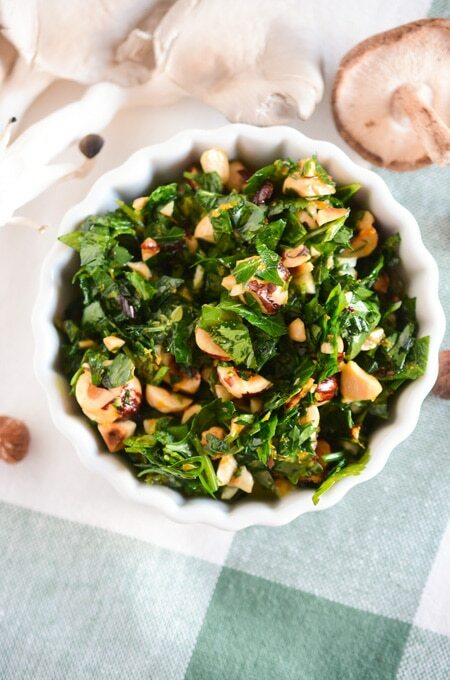 Mix together the parsley, olive oil, hazelnuts, orange peel and garlic in a small bowl. Set aside until needed. Place porcini mushrooms in a small bowl. Pour in 1 cup hot water. Let sit for about 30 minutes until the mushrooms have softened. Strain mushrooms over a bowl and reserve the liquid. Coarsely chop the mushrooms and set aside. Melt butter in a large pot or Dutch oven over medium-high heat. Add onion and carrot and cook until soft, about 5 minutes. Add cremini mushrooms and season with salt. Sauté mushrooms until they are soft and browned, about 5 minutes. Add the porcini mushrooms and cook for 3 more minutes. Pour in broth and reserved porcini liquid and bring to a boil. Cover and reduce the heat to medium-low and simmer for 20 minutes, until the mushrooms have softened. Cool for about 5 minutes. Working in 2 batches, puree mushrooms mixture in a blender until smooth. 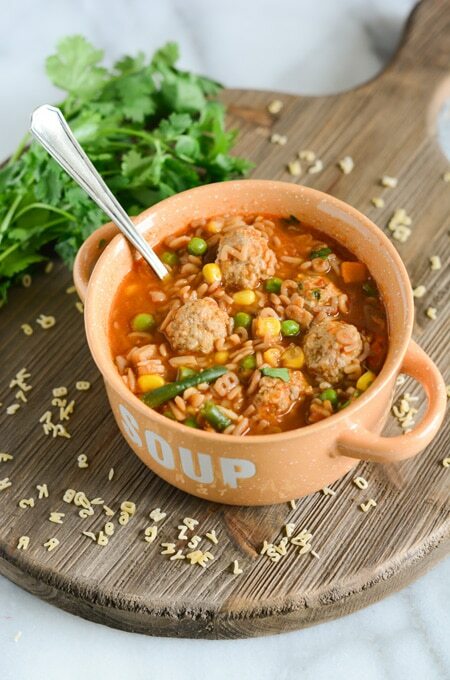 Return the soup to the Dutch oven and heat on low, stirring occasionally. Melt butter in a large sauté pan over medium-high heat. Add the mix of wild mushrooms and sauté until softened, about 10 minutes. Season with salt and pepper to taste. Divide soup into bowls and top with Mushroom Topping and Gremolata. Serve immediately.